Nobel Hygiene – Friends Adult Diapers recently released their campaign #BasPaanchMinuteAur. The campaign clocked over a million views on YouTube and managed to stir a conversation on social media. 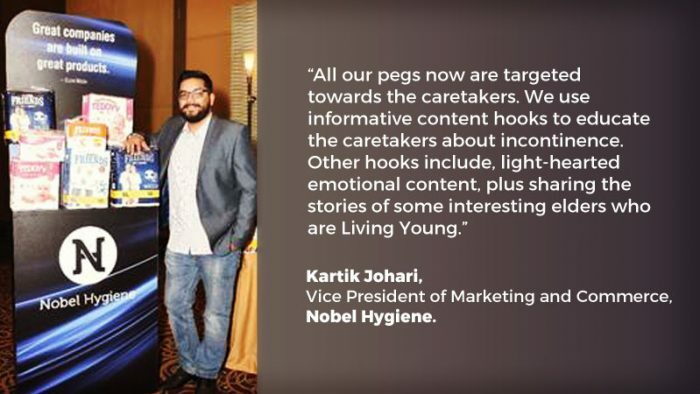 Social Samosa gets in conversation with Kartik Johari, Vice President of Marketing and Commerce, Nobel Hygiene to understand the brand’s social media strategy and how the campaign helped them achieve their objective. The brand’s recent campaign #BasPaanchMinuteAur managed to tug on our heartstrings, what was the objective of the campaign? The objective of the campaign was to simply start a conversation about adult diapers. Even though about 24 million people in India suffer from adult incontinence, any conversation about adult diapers is considered as taboo. We wanted to break this taboo and ensure that regular folk treat incontinence like any other disease. What was the brief given to the agency/team? The brief was to come up with a concept for our overnight Adult Diaper variant. The three-pronged objectives were, a.) To ensure the product isn’t shown as a substitute to using the washroom, b.) That it captures the perspective of both the caregiver and the caretaker, and c.) It should be authentic. What kind of the response have you received so far? For a conversation that’s just started in India we’ve received a phenomenal response. We’ve clocked over a million views on YouTube, we trended for over 5 hours across India with people from all over the country sharing stories of their loved ones, and managed to engage people about an ignored yet central problem. What do you think worked well for the campaign? We think the hook “Bas Paanch Minute Aur” is something that everyone resonated with and that worked very well for us. Much kudos to our entire production team for translating our feelings onto the screen!! How effective was the campaign in increasing awareness around the brand and the issue? The campaign helped us bring the conversation about adult diapers into the mainstream. Even though a lot of people suffer through incontinence not enough of them acknowledge it due to the “embarrassment” that goes with wearing adult diapers. This campaign helped us bridge that gap. How would you describe your social media strategy? How did the campaign fit it? Knowing that the topic is sensitive and the conversation around it should be mature, we didn’t want to indulge in any gimmicky form of marketing. We created a great piece of content, and seeded it appropriately for it to be picked up. We didn’t want to simply chase a certain #s of views, it was more important to be educative and get quality engagement. We wanted people to share with us their stories and eradicate the taboo around the subject. How much per cent of your marketing mix is reserved for social media? It’s a wavering number, but it’s close to 40% of our annual budget. Due to the product awareness being very low, it behoves us to try the informative and engaging route with rapid shifts, rather than a static ATL strategy. Given the nature of the brand, what kind of content hooks do you use to engage with your audience? After some primary research last year, we realised that the largest barrier for our messaging were the users themselves. Due to it being a taboo issue, an initial state of denial was to be expected for every senior. Additionally, seniors are not available on many social media channels. We realised, that a senior will be more amiable to discuss the issue with his family/caretaker in private, rather than a brand in public. Thus, all our pegs now are targeted towards the caretakers. We use informative content hooks to educate the caretakers about incontinence. Other hooks include, light-hearted emotional content, plus sharing the stories of some interesting elders who are Living Young! We of course have a lot of new ideas posted for this year. Your direct TG might not be actively available on social media. Who is your TG on social media? Our direct TG, which are the caretakers, are on social media. Anyone in the age group of 25-45, who has a close relationship with the seniors in their lives. What are the challenges faced when the brand is conversing around an issue as such? Unlike any other brand, we cannot have a direct conversation with our users which is the biggest challenge we face. What is your social media TDL for the coming months? We have 2 new pegs which we are quite excited about, along with another piece of digital content (all video). Additionally, we hope to share stories of places where we are directly helping seniors. We also hope to have a larger campaign in August which will tie in to other ATL efforts. Instagram Location Stories in Explore, Stories Search could be next!